Education: Brighton College & USATF Level 2 Coach. I was born and raised in the South of England moving to the USA at age twenty four. Three years later at the challenge of my older sister Nicole my running career was born and in 1990 I ran my first marathon in NYC. By 2016 I have run twenty seven marathons, improved my marathon time from 4.41-2.34 and my mile time from ten minutes to 4.21. During that time I began a coaching career, co founded The Iron Maidens All Women’s Running Group, founded the Run Tall, Run Easy Method of running, authored two Editions of a book of the same name, I guest speak and provide Emcee work at races across North America, work through the night for UPS and I married the love of my life Kathleen in 1999 and am the very proud father to the two heartbeats of my life Luke and Sam. I am extremely proud of my athletes that I coach globally and am blessed to be able to do what I love to do and in the process help ordinary people to achieve extraordinary things. One of the most satisfying elements to my professional and personal life has been my relationship, friendship and work with Michaela Johnson and all the Team Boomer staff and athletes that I have met and worked with since 2010. It has been such a blessing to be able to give back to those that need help through the sport of running that I am so passionate about and that has taught me so many life lessons over the years. It is truly an honor for me and one that I am extremely grateful for. Specifically our athletes with Cystic Fibrosis and their families serve as such an inspiration to me and forge me to drive forward on their behalf to do whatever I can to assist in the fight against this deadly disease. I am extremely grateful to Boomer Esiason for affording me the opportunity to be part of such a wonderful team as Team Boomer. There are so many but perhaps coaching Randi Tannenbaum one of our 2011 Team Boomer runners in the NYM. We knew going in that Randi had a hip labral tear and common sense would suggest the marathon not being a great idea. However, the human spirit cannot be contained and Randi was determined to run the race as she has young family members with CF. As such since it was a ‘fait a complit’ that she could not be talked out of it, I was then ‘all in’ to coach Randi to the starting line and through the race against the odds and to make sure that she did so as safely as we possibly could. When we hugged with tears of joy post race on Central Park West after we achieved what we set out to achieve I know I will never forget that memory. I will also never forget the one and only Jerry Cahill completing the Run To Breathe race in Central Park just a few weeks after a double lung transplant. As aforementioned there is no limit to the human spirit and Jerry is human spirit personified ! What does Coaching Team Boomer mean to you? Everything… everything that life is about, everything that good stands for, everything that encapsulates fighting for what is just and right, everything that is represented by standing behind and beside those that are less fortunate, and whilst I am aware that I am in a position to give my help and expertise to those that need it, it cannot be overstated that in return Team Boomer and its team members give me and teach me so much more !! 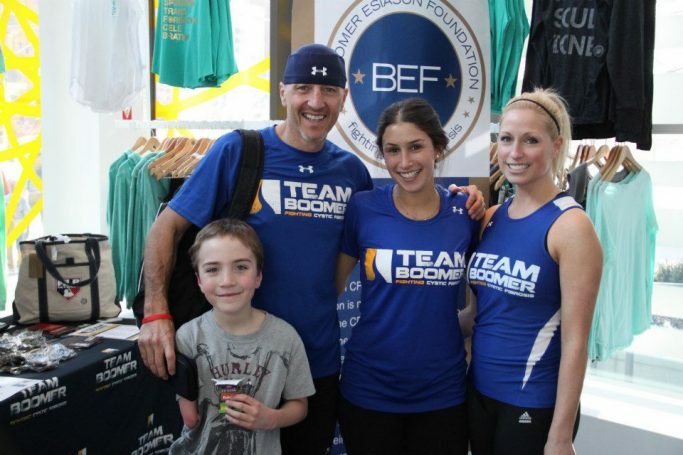 What inspires you to exercise, stay fit and support Team Boomer? Because there is still unfinished business and much more work to be done !~ Let’s roll !